Choosing the right window type during home construction or renovation is very important. Fitting right window at proper place will help enter natural light come in home, maintain proper airflow and of course can even help conserve energy.Many Australian homeowners choose Aluminum Louvre Windows as they are stylish, versatile and can help to naturally ventilate your home. Louvre windows consists of a frame which blind or shutter with horizontal slats that are angled to let in light and air, but to keep out rain, direct sunshine, and noise. The angle of the slats may be adjustable by simply use the lever or handle. Why Choose Aluminum Louvre Windows? Wider Opening Capacity: Louvre windows are able to open 2X as wide as regular windows allowing for maximum airflow. Natural air flow will help to keep your home cool and comfortable and save power bills. Easy to maintain: No expertise required while cleaning Louvre Windows. Louvre windows are considerably easier to clean than other windows because they tilt 180 degree so you can easily clean both sides of glass. Adjustable slats: Adjustable slats will help to control direct air flow. You can angle the slats from fully closed to fully open and virtually any angle in between. You can actually tilt the slats upward. This allows you to direct cool air towards the ceiling. Versatile and Stylish: Louvre windows are versatile because they can fit into whatever interior design your home might have. They are also available in different design and styles. Great for privacy: You can use mix frosted or colored glass louver windows with regular windows for complete control over privacy. Wide Choice of slats material: Slats of Louvre windows are made of different material like glass, timber or powder coated aluminium. 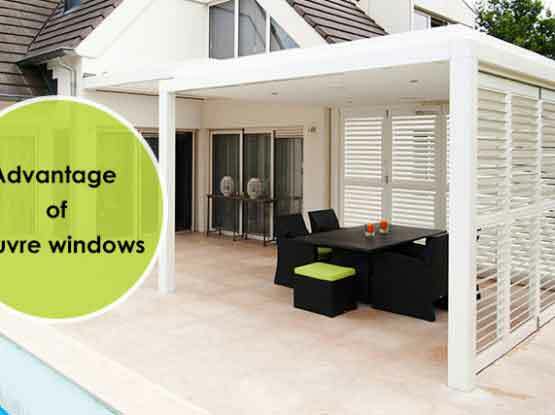 Louvre windows can also be fitted with fly screens or security screens.